Systole is the phase of the cardiac cycle in which the heart muscles are contracted. Systole can be divided into atrial systole in which the atria contract, and ventricular systole when the ventricles contract. The other phase of the cardiac cycle is diastole, when all the muscles relax. Atrial systole moves blood from the atria into the ventricles, while ventricular systole moves blood out of the heart into the pulmonary and systemic circulations. Systole will end as diastole begins, and allows blood to fill the heart again. 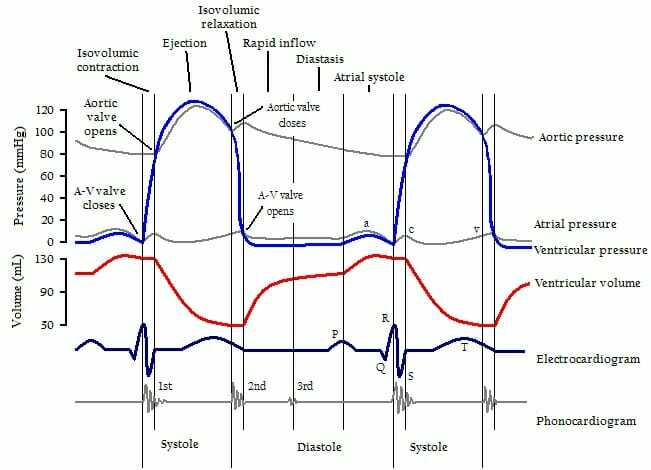 The following diagram shows systole in the context of the entire cardiac cycle. Note that during systole, the ventricular pressure and arterial pressure spike. This coincides with the systolic pressure in the measurement of blood pressure. In a blood pressure measurement, the top number refers to the pressure in the arteries during systole. The bottom number is the diastolic pressure, or pressure of the arteries when the heart is relaxed. Systole can also be seen in an electrocardiogram, which is shown on the graph above. The electrocardiogram measure the electrical activity of the heart. Large changes in the electrical activity represent destabilization of the nerve membrane, which causes muscles to contract. The “QRS” peaks on the electrocardiogram represent the start of systole. Atrial systole starts just before this, caused by the destabilization of “P” on the electrocardiogram. This destabilization occurs in the sinoatrial node in the mammalian heart, and controls the pulse. Diastole – The relaxed condition of the heart, being the opposite phase in the cardiac cycle. Electrical Systole – The nerve impulse signaling the heart muscles to contract. Mechanical Systole – The actual contraction of the muscle fibers of heart tissue. Sinoatrial Node – The nerve-embedded region of the right atrium which starts systole by causing the initial nerve impulse. 1. Which of the following must follow the systole phase of the cardiac cycle in order for the heart to pump blood? B is correct. The phase of diastole occurs after systole, in which the muscles of the heart relax. During this phase, the heart can refill with blood. The lack of pressure in the ventricles allows the valves between the atria and ventricles to open, not close. This allows blood to fill the heart. Cells of the heart continually resupply on glucose from the bloodstream, and convert that glucose to ATP. Diastole does relieve the pressure on the cardiac arteries, allowing blood to flow to these cells, but the cells continually cycle nutrients in and out of their cells. 2. In the hagfish, the cardiac cycle is not organized rhythmically, as it is in higher animals. Does the hagfish heart, which consists of one atrium and one ventricle, go through the phase of systole? A is correct. While the cardiac cycle is not regulated in hagfish, the atrium and ventricle each go through periods of systole, and each go through periods of diastole. Effectively, this still fills the chambers with blood and moves it through the circulatory system, but the hagfish heart is much less efficient than our own. By timing the contractions and keeping the cycles in rhythm, the blood flows consistently in one direction and the two chambers of the heart do not work against each other.